Thought I'd try the latest build to check out the new classes, and got this during character creation. 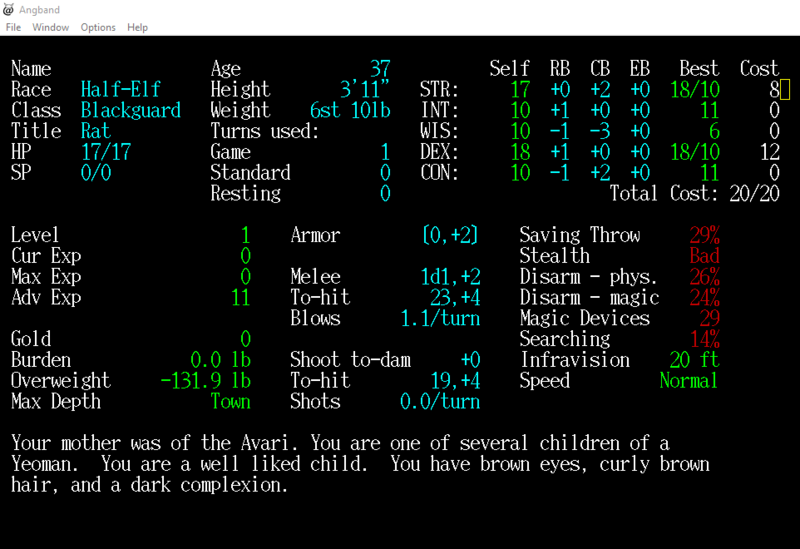 Are half-elves meant to be subject to dwarfism or is this a bug? Guess it's only the top half. That is the birth screen with 1d1 fists. It should show the maximum possible blows. I am surprised it is only 1.1 for half-elf or human. Blackguards have 10lb fists. I've never played one, they have some sort of odd combat mechanics, apparently they are quite OP. Well spotted! I'm clueless about how that gets calculated, and the documentation doesn't really help with that. I'd be happy to help update/expand documentation (I'm a tech writer and have a lot of free time on my hands at the moment) if people are willing to field questions. I have enough understanding of C lib files to figure some things out on my own, but I'm not a programmer and my maths skills are limited. What I *do* understand is the non-coder's POV, which is something usually lacking in open source projects. I've been deterred in the past because the response to previous offers to contribute has been pretty much "figure it out yourself" (this applies to every open source project I've ever been even tangentially involved with), but maybe if I started a thread for discussion of documentation issues? so as not to clog up Nick's thread. As you can see it isn't a simple calculation. Feel free to ask questions if you have trouble following. I have trouble myself. Thanks wobbly, I'll take a look at it. Re: comments about blackguards being OP, I'm not so sure. You have to put an awful lot of points into INT to be able to even use your limited magic at the levels you gain the spells -- I'm 19th level right now and still only have half the mana I need to use the Berserk Rage spell I got at 14th, and haven't actually used Dark Focus yet because I've got this giant stack of ?Blessing and !Heroism and keep finding more. It seems a bit inefficient to me. Thanks, filed as a bug. Are we sure the interupt for run is working properly? In both V & feature. I just got double breathed on by a water vortex while running down a hall. Not the 1st time I've seen this either, it seems I get hit & then take another step. I also notice something funky when chasing something down a hall where it'll be in vision, move out of vision & I just continue running. I've seen similar stuff. No exact observation though. Thought it may have with burden penalty to do rather than running. Filed as a bug; I'll check it at least. I've been playing a Druid for the last couple of days and having a lot of fun with it. I haven't gotten to a high level yet so I'm unsure what additional spells exist beyond the first two spellbooks, but I've got a couple of ideas I thought I'd throw out there. 1. Foxes burrow; what if Druids got a bonus to tunneling in Fox Form? A buff to Searching might be nice too, to reflect enhanced sense of smell (although I guess most traps probably don't smell of much, the lingering scent of the creature that set them might). Currently Dwarves are the only thing that gets any innate tunneling, but the ability to stealth through a level digging out all the gold and/or stealing items guarded by monsters by burrowing through (non-granite) walls while still too weak to fight them could be really fun. It occurs to me that it is possible that a vortex could get two shots in a single turn in any case: non-uniques can be slightl6ly faster than their normal speed, and vortexes breathe often enough that it is not inconceivable that the diuble move could coincide with a double breath.